I love quick and easy dinner meals. You can even make this easier by just combining all the ingredients in the pot and throwing it all right away in the oven. However, the flavor will not be as developed compared to if you followed each of the steps in this recipe (I have done both). Taking the time to marinade the chicken for a few minutes and pan-searing it really are necessary steps for a very flavorful chicken meal. Cover potatoes in cold , salted water in a saucepan. Bring to a boil and cook until tender, about 8 minutes. Drain, cut in quarters then set aside. In a medium bowl, combine 1 tbsp chopped rosemary, garlic, salt, red pepper flakes, juice of 1 lemon and olive oil. Add chicken and turn to coat. Let marinade for 5 minutes. 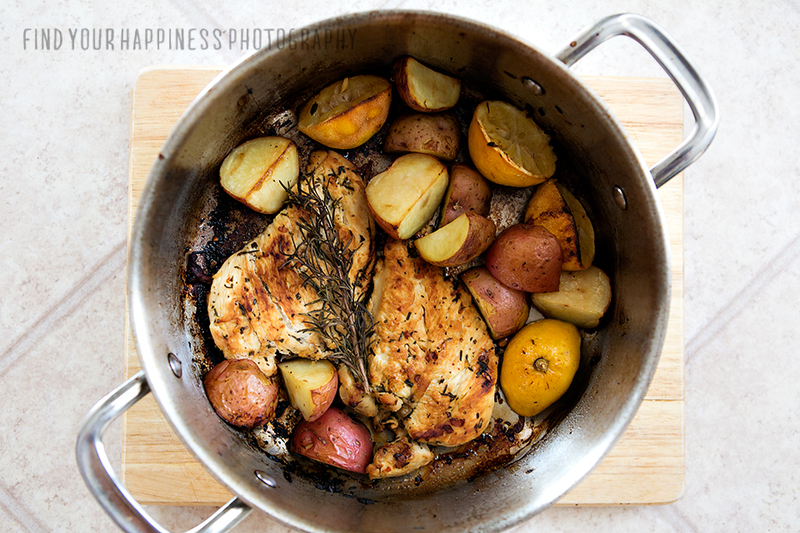 Heat a large cast iron skillet (or any oven safe skillet/pot) over medium-high heat. Add chicken and cook until all the juices have evaporated. Continue to cook until chicken is lightly browned on both sides. Add potatoes and the juice of the remaining lemon. Add rosemary sprig and reserved squeezed lemon halves. Transfer the skillet to the pre-heated oven, uncovered. Cook until chicken is no longer pink in middle, about 25 minutes. Enjoy.